SPORT 10.12 delicata emulsione altamente efficace nel prevenire e combattere in modo naturale il formarsi di cattivi odori, senza interferire con la normale traspirazione della pelle. La sua azione deodorante dura per tutta la giornata. 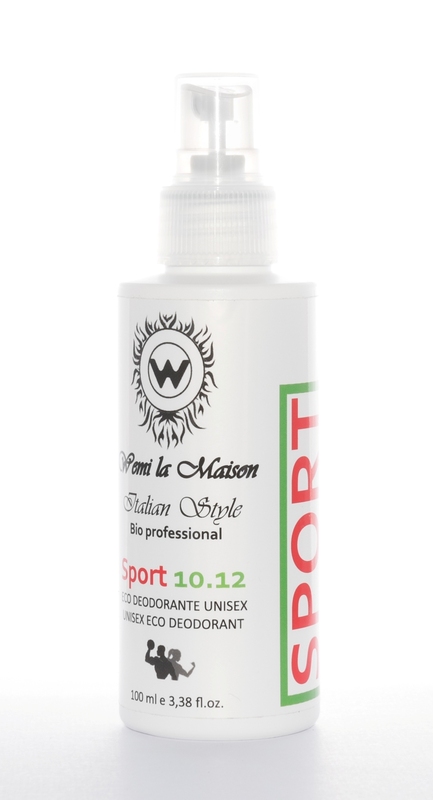 SPORT 10.12 is a delicate yet highly effective emulsion in naturally preventing and combating the formation of bad odours, without interfering with the normal perspiration of the skin. Its deodorising action lasts for the entire day. Aqua, Coco-caprylate, Zinc ricinoleate, Polyglyceryl-3 stearate, Sodium stearoyl lactylate, Triethyl citrate, Calendula officinalis flower extract (*), Avena sativa bran extract (*), Hamamelis virginiana leaf extract (*), Cetearyl alcohol, Glyceryl stearate, Bisabolol, Lactic acid, Allantoin, Glycerin, Phenethyl alcohol, Caprylyl glycol, Parfum.